Before his death in a 1935 airplane crash, Will Rogers was the original King of All Media: stage (vaudeville and the Ziegfeld Follies), his newspaper column, radio, and film (silent and talkie), a combination of Dave Barry, Jeff Foxworthy, and Stephen Colbert. Even though he died more than 80 years ago, many of his political and social jokes still ring true. 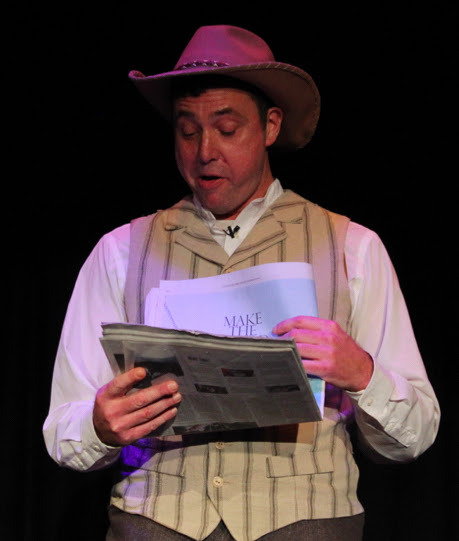 The Will Rogers Follies: a life in review is a nostalgic musical look at Rogers’ life and work, now playing at Roger Rocka’s Dinner Theatre through March 12. The Good Company Players production, directed with his customary care by Dan Pessano, goes from laid-back to razzle-dazzle as Florenz Ziegfeld brings Rogers back from the dead to relive his career…with showgirls and chorus lines thrown in to liven up a not-very-scandalous life, and to fit the great showman’s pattern for a show, where Act One ends with a wedding and someone has to sing a torch song. The Peter Stone/Betty Comden/Adolph Green/Cy Coleman show was written for John Denver, who quit over a perceived insult. Keith Carradine starred in it on Broadway in 1991, and the lead has been played by Mac Davis, Larry Gatlin, and Pat Boone. Here, Ted Nunes plays Rogers, singing, spinning a rope, strumming a guitar, and saying many of the humorist’s classic lines (and a few cracks at modern political targets). His folksy, aw-shucks delivery is comforting and endearing. Abigail Nolte is an amazing powerhouse on stage, but she throttles it down most of the time as Will’s wife Betty Blake, busting loose on the plaintive “No Man Left for Me.” Greg Ruud plays cantankerous and wise as Clem Rogers, Will’s dad, who doesn’t let death stop him from dispensing unwanted advice. Ginger Kay Lewis-Reed costumes the chorus in Western/patriotic red, white, and blue, dresses non-showfolk in slightly-heightened period ware, and gowns “Presents for Mrs. Rogers” in oh-wow Art Deco and Ert. David Pierce manages to shoehorn over-the-top Broadway looks into a shoebox stage; his sweeping skyscape curtain is inspiring. To keep the cast on their toes and seats, Ashley Wilkinson choreographed some intricate hand-jivey routines. 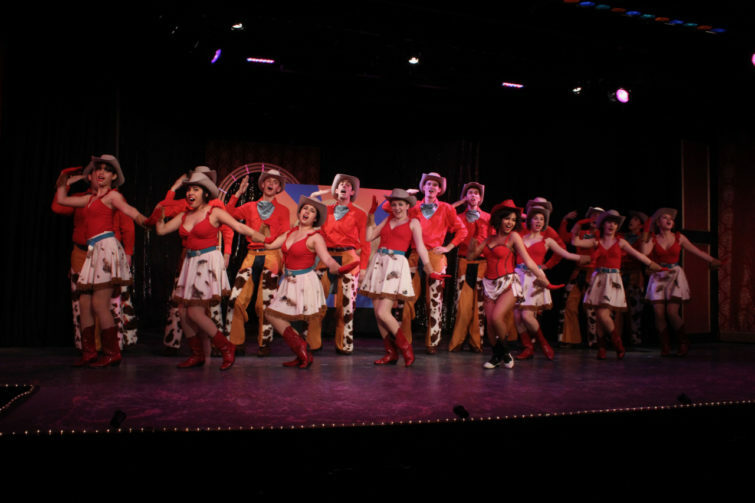 Shawn Williams directed the Junior Company in their rousing tribute to young singers and youth-based shows, from the Mickey Mouse Club and David Cassidy to Les Miz and the Brady Bunch. By the way, for dessert at intermission, I recommend the Buttermilk Pie—it’s like a pecan pie without the pecans, quite caramelly and custardy. 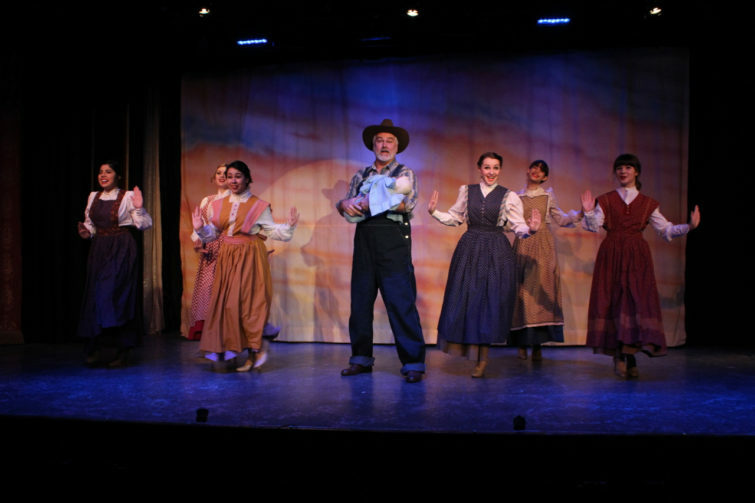 Roger Rocka’s Dinner Theater is at 1226 N Wishon Ave. For more information, call (559) 266-9494 or go to gcplayers.com and on KRL’s Good Company Players event page.